Efficient life-cycle management of the built environment requires ALL of the following. As a Real Property Owner, how do are you doing? The AEC and Facilities Management industry is fragmented and unproductive. While many have looked towards technology as the “silver bullet”, software simply can’t correct poor business practices, lack of requisite skills, and an industry resistant to change. One need to look no further than the stagnation of BIM in the U.S. and the U.K. to see that software is not the compass that will navigate the AEC and FM sector towards a higher percentage of quality outcomes delivered in a timely manner and on-budget. The core elements required to drive the AEC and FM sector toward better outcomes are listed below. Obsolete technology… reliance upon monolithic IWMS and/or BIM systems. Focus upon “the weeds”… forced levels of rigid detail versus common understanding. Costly, inflexible, and/or untimely revision cycle “standards”..(i.e. “ISO”, “NBIMS” …) versus “open” flexible guidelines and crowd sourced and shared knowledge. No minimum level of competency and lack of proper oversight. The AEC and FM industry lacks coordination due to void of life-cycle based based goals and objectives and an associated lack of focus upon OUTCOMES. Owners simply lack the capability, competencies, and/or motivation to engage in leadership. Collaboration, coordination, and improved productivity can only occur within a framework of goals, competent actors, resources, and activities. The linkage between the built environment and organizational goals is usually taken for granted or simply not understood, and certainly very rarely proactively managed. Actors and activities are linked by inter-dependencies which must be formally structured, if not mandated via collaborative construction delivery methods. Similarly competencies in all requisite AEC and FM domains must be required. Clarity and purpose must be provided by Real Property Owners as well as formal education and ongoing professional training. While technology has its supporting role, Owner must firmly be in the drivers seat… steering the AEC and FM sectors toward efficient life-cycle asset management strategies and practices. Collaborative Construction Project Delivery & Skilled Teams provide the basis for measurably improving outcomes, specifically a higher percentage of project complete on-time, on-budget, and to the satisfaction of all participants and stakeholders. While ever renovation, repair, maintenance, or capital project has its own uniqueness, fundamental elements are essentially the same. Thus, the consistent application of robust best management practices and workflows is central to improving facility and infrastructure management outcomes. Owner leadership, fostering communication and collaboration, while not exercising excessive management and control is a core requirement. Owners are ultimately responsible for their built structures and thus must be capable throughout project delivery cycles. LEAN best management practices, adapted to life-cycle facility and infrastructure management, provide a proven way to drive continuous improvement throughout all aspects of architecture, engineering, construction, and operations. Early involvement of all parties through LEAN collaborative construction delivery methods such as integrated delivery , IPD and Job Order Contracting, JOC ensures that the expertise of the professionals involved at all stages will be leveraged to improve processes and outcomes throughout all stages or a project. Understanding how to develop, deploy, and monitor a LEAN Construction Delivery Program must be focus of our educational and professional development institutions and resources. How program and project teams are selected, procured, contracted, and coordinated throughout project delivery are requisite competencies. LEAN Collaborate Construction Delivery Methods bind and provide incentives for multi-party (owner, contractor, A/E, etc.) project delivery teams. Successful construction project management requires the integration of multiple competencies, technologies, and business processes. Owners MUST be capable of provide the appropriate level of oversight across this entire spectrum. I find IWMS systems problematic for the following reasons. First and foremost, IWMS systems typically start as a monolithic application, with expertise in one area. For example, a software company that built a CMMS system, then decides to add a capital planning module (CPMS) or a space planning module (CAFM), or a project delivery module. Without appropriate domain expertise the result is a system that does a lot of things in a mediocre manner, vs. an integration of “best in class” solutions. With the advent of cloud computing, Owners can easily select “best in class” solutions and simply treat them as “plug-ins” to their private cloud. Traditional software programs as we have known them are dying, and being replace by applets…think of your smart phone. The real key is for Owners to develop life-cycle management capabilities. Owners focus must be upon assuring robust ontology and the adoption of transparent, proven business processes. Strategic portfolio management, collaborative project delivery (IPD – integrated project delivery, JOC – job order contracting), optimized portfolio operations management, and maximization of available resources must be the mantra for Owners. Technology is no longer an issue, it’s Owner expertise. Technology should never dictate process, its role is to support low cost, consistent deployment of organization best practices, and to improve transparency, collaboration, information reuse, and decision support. via http://www.4Clicks.com – 4Clicks provides advanced solutions for the construction industry with powerful tools to connect people, information and processes – anytime, anywhere. Leveraging software to enable better decisions requires a robust, shared ontology, quantitative and qualitative metrics, sound processes/business practices, as well as transparency and collaboration. Certainly it has been don within certain areas such as cost estimating using common / well designed cost databases with integrated contract, project, and document management. However across the full life-cycle of a structure? Our industry, (AECOO – Architects, Engineers, Owners, Operators…), needs to focus upon the built environment from a life-cycle vs. first cost perspective. This requires a fundamental change in thinking, business process and tools. Parametrics are needed to enable what-if analysis while varying time, cost, materials, etc. For example, there is a reason, if not a mandate, for all large building portfolio owners to conduct ongoing 5-10-25-50 year planning while considering various capital reinvestment scenarios. The convergence of processes, people, and technology is accelerating due to cloud computing (a disruptive technology). As process becoming transparent, change will become both more palatable and more frequent. Traditional linear construction delivery methods such as design-bid-build are antiquated. “Newer” collaborative construction delivery such as IPD – integrated project delivery and JOC – job order contracting, and others will begin to mitigate waste, and improve stakeholder relationships. Actionable, transparent information, collaboration, and supporting technology are requirements in reaching the goal of more efficient construction project delivery and life-cycle management of the built environment. While “big data” may be viewed as a buzzword, it is also a necessity as all built environment stakeholders are tasked with “doing more with less”. The cornerstone of big data is a robust ontology. Ontology is a robust set of terms and definitions and their defined linkages/associations for a specified purpose. Ontology is a requirement for any robust business process. Any improvement to the current excessive levels of waste within the construction sector is impossible without all stakeholders working with common, transparent information. One excellent example of an application of common information is RSMeans Cost Data. Leveraging RSMeans Cost Data as the basis for Owner, Contractor, AE, and Oversight Group activities provide immediate benefits. Planners, Procurement, Cost Estimators, Program Managers, Engineers, Architects, Facility Managers; virtually all local and global professionals and entities; would be able to track contract, project, and estimate information and get more project done on-time and on-budget to the benefit of the Government, Contractors, Subs, and AEs. 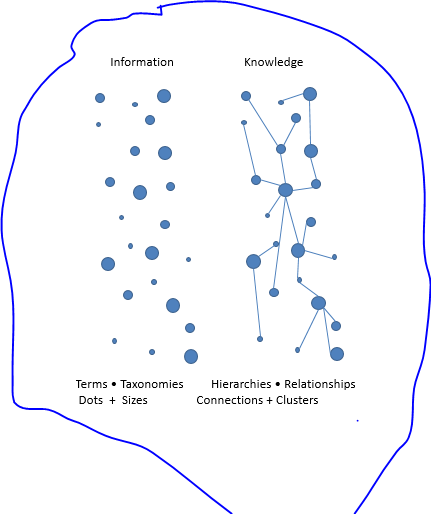 Multiple cross knowledge domain competencies and associated robust business process are equally important (See Figure 1). Of all of these the enterprise application of collaborative construction delivery methods; such as Integrated Project Delivery, IPD and Job Order Contracting, JOC; are important prerequisites on the path toward greater efficiency. Collaborative and/or “lean” construction delivery methods are not new. They are proven business process that have had decades of field application. Education and awareness, however, is limited in this area. Very few if any Owners have applied these and/or similar “best practices” on an enterprise level, while some have deployed on a local level/site level. Technology is also a core element in that is place an enabling role by lowering implementation costs while also supporting consistent deployment, information sharing, ongoing monitoring, and continuous improvement. Thus the question remains, why has significant improvement in construction efficiency yet to occur on a widespread basis? The answers are both simple and complex. Owners have not taken a leadership role. They pay the bills and are ultimately responsible for the “end product”, the built environment. Education needs to be changed and improved from higher education throughout all related professional areas. Focus is required upon fundamental life-cycle management and total cost of ownership business processes. The concept of global oversight with local action must be observed and practiced, along with a cultural shift from ad-hoc, linear, and antagonistic business process such as design-bid-build, to collaborative methods that involve stakeholders earlier in the decision making process. The culture change is major. Owners. Contractors. And AEs must work together toward common goals, with shared risk/reward, and with the same information. How many participants are currently capable of doing this? Stakeholders: Architects, Engineers, Contractors, Operators, Building Product Manufacturers, Building/Structure Users, Oversight Groups, Community at Large, Software OEMs. It’s time for Owners to stop the marketing… Stop hyping their LEED Silver or “Whatever” Buildings… and actually participate in life-cycle management of the built environment supported by digital technology. 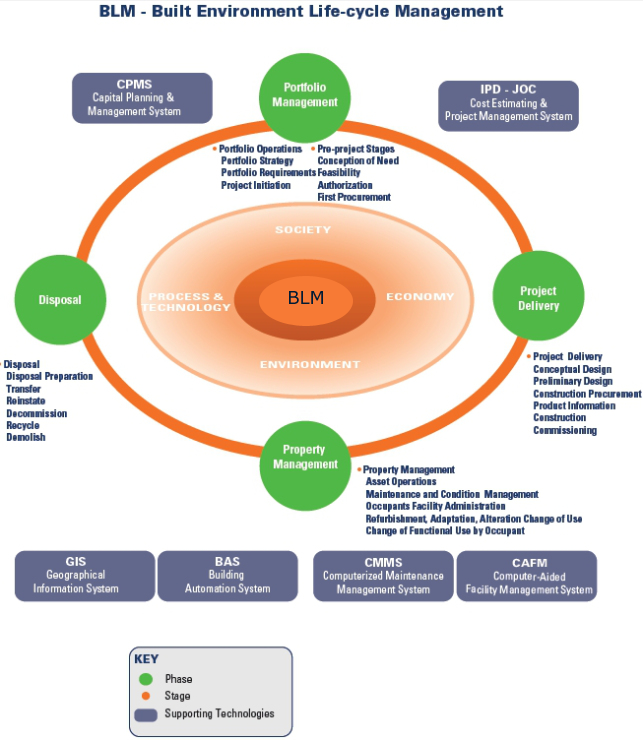 This is the real BIM / BLM (built-environment life-cycle management) and it’s critical to the financial, economic and mission goals of many/most organizations. Improved decision making with respect to construction, repair, renovation, operations, and sustainability of the built environment, as well as associated efficient construction project delivery has several basic requirements. 1. 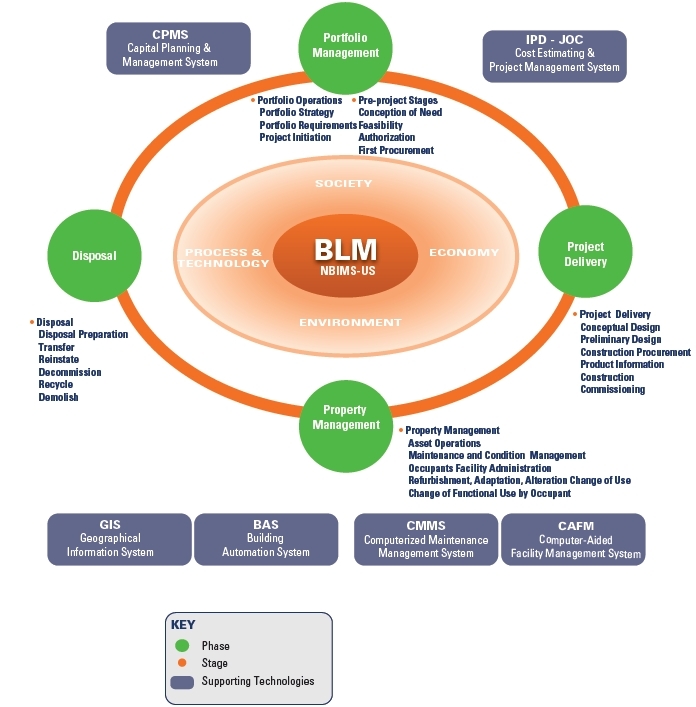 Recognition and consistent implementation of built-environment life-cycle management (BLM) “best practices” relative to business processes, workflows, requisite competencies, technologies, information management requirements, and associated metrics. 2. Standardized robust terms, definitions, and inter-relationships for all associated built environment practice areas and/or competencies. 3. A focus upon life-cycle costs vs. first costs in terms finance and environmental impact. 4. Collaborative project delivery methods and practices such as Integrated Project Delivery (IPD), Job Order Contracting, (JOC), and Public Private Partnerships (PPP) vs. traditional ad-hoc and antagonistic methods such as design-bid-build (DBB) or interim methods such as design build (DB). 5. Continuous monitoring and improvement. Owners pay the bills are ultimately responsible for managing the built environment efficiently. It’s beyond time that many/most Owners get started!